WHAT IS A WOLF HYBRID? Wolves are symbols of the wild but what happens when a dog is crossed with a 100% wolf? The mystique is lost and the hybrid results may be disappointing. Wolf hybrids are found throughout the U.S. and many are turned into rescue facilities due to aggression or unpredictable behavior due to their wild animal instinct. A wolf hybrid is a wild wolf bred to a domestic dog such as a German Shepherd Dog, Malamute, Husky or other large breed. Some claim they make acceptable pets but not everyone can guarantee control over the natural behavior of a hybrid wolf at maturity, even people who produce hybrids of a low wolf percentage. The hybrid wolf dog is not easy to own. The dog desires kindness and interaction. It aims to please. While wolves respect the pack leader, it may not see the owner in the same way. One assumes critical responsibility as a wolf hybrid owner who can never be “off their game”. Wolf hybrid puppy play may seem harmless but with physical and sexual maturity, the hybrid may evolve into the predator it was meant to be. The wolf-part is hard wired to roam and can easily break the strongest chain or escape enclosure. It must be remember that their strength and wild genes enable them to bring down a 1200 pound moose easily so even in play they can do harm. Wolves will challenge before attacking a pack mate or the leader but the signals may be too subtle for a human to understand. If corrected, a wolf hybrid may retreat but unless firmly put in pack order, will pursue an endless need for dominance. If your dog is hungry, it goes to the food bowl twice a day. Wolves do not eat in this manner. If they escape confinement, they will prowl the area, attacking cats, rabbits, goats, sheep, and dogs. The wolf eats 20 plus pounds at a setting. His “resource guarding instinct” is superior to the long domesticated dog. A wolf will threaten anything approaching its kill. 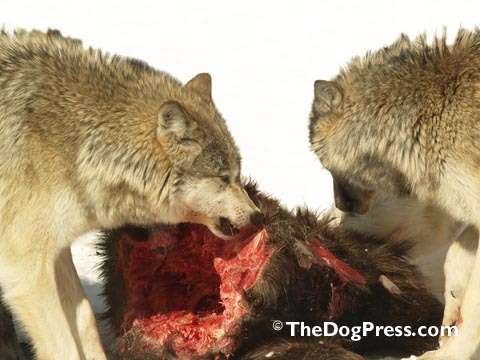 Wolves have never-ending competition for food and social rank. Other drawbacks to owning a wolf hybrid? Wolves urinate to communicate. They are guilty of tearing cabinets and furniture apart. Wolves are problem solvers and don’t need human assistance. Wary and cautious, they learn from doing. There is no “warm, fuzzy feeling” with a wolf hybrid. Wolf hybrids feel little loyalty or affection outside of its own pack. The domestic dog bites and releases. The wolf’s skull, being 30% larger than the canine, has jaws that apply massive crushing damage to bones. The entire head, skull and face are employed when the powerful jaws “lock” on prey. The wolf does NOT turn loose! The jaw strength is impressive and it is twice that of a Pit Bull. Only the hyena’s bite exceeds the wolf’s bite in crushing pressure. Therefore, although dogs and wolves are similar, they are “miles apart”. Dogs breed anytime! Wolves not only have a specific “breeding season”, their testicles somewhat retract out of season. Smelling pheromones, their raised hackles release scent. They also have scent glands around their tails. The domestic dog whelps in the home and allows interaction with her puppies. Wolves work as a pack to feed the young and the protective mother (or the appointed “Uncle” who babysits the cubs in her absence) is otherwise fierce and unapproachable. The mother wolf will regurgitate digested food for her young up to 2 years of age. Wolves have extremely strong neck muscles to bring down large prey. They can lift and throw prey larger than themselves. They have straighter shoulders, elbows are tight, and chests are narrow to help them cut through snow. Their feet are large with powerful claws. The wolf’s frame is long, lean and muscular. How big do wolves really get? 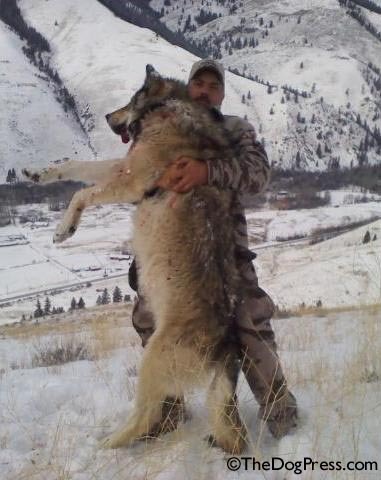 Some wolves stand 36” at the shoulder and can be 5-7 feet long weighing well over 120 pounds. Males weighing 170 pounds are not uncommon in the wild. Wolves are made for efficiency of movement and can lope all day long at 5-8 miles per hour. Wolves they can leap vertically up to 8 feet and have been known to run 30-45 miles per hour. Dogs, on the other hand have been clocked at 15-30 mph and their endurance is limited. Both are subject to the same parasites. Young wolves start joining the hunts as early as 6 months of age. Some young dominant males may leave the pack as early as 1 year of age and join another pack. Others may establish their own pack, especially during mating season. Wolves have acute hearing and can identify small animals under snow and their stiff legged pounce is deadly. A wolf pack’s howls can be heard up to 10 miles. The vocal range is specific. It includes barking, whining, squealing, growling, and snarling. The body language and communication is far advanced in the wolf compared to a dog, not only vocally, but also scent capabilities. Wolves inhabit our national parks and are protected. They assist in controlling overpopulated areas of elk and deer. The wolf is truly a symbol of nature in the wild and their unpredictable nature and wariness insures their survival. Many states have laws against owning wolves, even hybrid wolves. Authorization from the department of natural resources is required as well as a permit. Sale of such animals is not permitted. In Illinois owning a hybrid constitutes a violation of Section 1 of the Illinois Dangerous Animals Act (720 ILC5 585/1J). Veterinarians in Illinois are now allowed to vaccinate wolf hybrids. They are subject to confiscation by Animal Control. Indiana has a sanctuary for wolf hybrids. For information go to www.HybridLAW.com. Humans adopted dogs to fit our needs and requirements. Dogs in turn, adapted to our lifestyle to become our faithful and loyal companions. A wolf hybrid is not a canine most home owners can readily handle. Breeding wolves and dogs together depreciates both species. The wolf’s predator abilities are lessened and the dog’s friendly and affectionate nature with people cannot be relied on. A wolf hybrid is not a canine and is more animal than most owners can readily handle.